Be strong all day long. Leverage four sources of strength by drawing strength from your mind, body, emotions, and spirit. Life can have a lot of ups and downs and your ability to bounce back is one of the keys to your success. This is a simple model I put together as part of my 30 Day Bootcamp on Getting Results to help you multiply your ability to bounce back in any situation. I wasn’t sure whether to call my model a 4×4 Force Multiplier Frame or Four Sources of Strength. For now, I’m going with Four Sources of Strength. If you know somebody who’s been knocked down and needs help getting back up, share this frame with them as a way to help them get back on their feet and find their sources of strength from the inside out. I tried to keep the model as simple as possible and easy to remember, while giving you a variety of sources of strength and energy to draw from. I wanted this frame to serve as an “at a glance” reminder of how you are a force of one, from the inside out, as well as from the outside in. Change your frame to change your game. 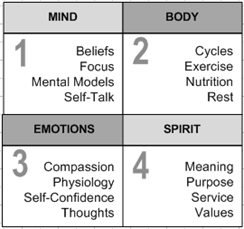 You can use each of the four boxes as a lens for looking at your source of strength. For example, in terms of mind and mental strength, some of your primary sources are your beliefs, what you focus on, the mental models you use, and your self-talk. You can draw from the Four Sources of Strength when you need to bounce back or when you want to make the most of what you’ve got. It’s a more consistent way of helping you fire on call cylinders. These four resonate w/me ton. I especially appreciate your prescriptive guidance here – do’s and don’t’s – which makes this laser sharp actionable. This weekend I just got over a cold, I can definitely see how each of the four pillars you mentioned can be used in even the simple case of coming back from a cold. I’ll have to share this. @ Alik — Thank you. I like that it’s a “better together” story, and they all build on each other, yet each lens is useful on it’s own, too. @ Bryce — Thank you. Summer colds are the worst — they know how to linger. It’s great that you’re bouncing back, and thanks for sharing. 1. “Focus on what you control and let the rest go”. 2. “You can change your focus by changing the question”. 3. “Don’t keep solving the same problems. Burnout isn’t caused by working hard or working long hours. It’s caused by working on the same problems or not making progress”. 4. “Think the thoughts that serve you. Your thoughts create your energy”. 5. “Take action. Sometimes you have to take action first and then energy and motivation follow”. 6. “Leverage your relationships and network. There is strength in numbers or even just somebody who wants to listen”. 7. “Find your “why.” This is how you light your fire from the inside out”. 8. “Make it bigger than yourself. Find a cause where you can put your focus on something you think is great”. This is a fantastic framework, not just to bounce back, but to take us to the next level. I enables us to see which areas we are focusing in most, and which need work…..and by working harder in one area, it will affect all others. Thanks JD for reminding me to focus in all areas. 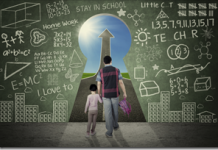 This is definitely a great article to share and a personal “keeper”. Thanks JD for contributing to my work in progress self development! Hi JD .. the 4 Sources of Strength definitely makes it easier to relate to .. and easier to understand .. Mind Body Spirit Emotions .. I’d get lost with the words .. 4 x 4 Force Multiplier Frame ..
@ Riza — Thank you. I like your cherry-picked set. It spans the multiple sources nicely. @ Kate — Thank you. It sounds like you found a healthy rhythm for managing your personal cadence, and that’s a great way to get to the next level. Self-awareness is a powerful thing. @ Christine — Thank you. From a personal development standpoint, it’s a force multiplier. @ Hilary — Thank you. I’m starting to like the simplicity of the name. I think the examples in this case really help make the model real and bring it to life.